A front will get hung up just offshore for the weekend. Scattered morning showers are likely today but enough dry air should work in from the West to burn off the clouds by afternoon (meaning the sun should shine). This afternoon will be warm. On Sunday a storm will develop over the Ohio valley and ride North into New England by Monday. The day will be mostly cloudy. Spotty showers are likely Sunday. By no means will Sunday be a washout. Rain is likely Sunday night and Monday morning. Drier conditions are expected later Monday into the midweek period with readings near the seasonal average of 60º. Scattered morning showers, otherwise skies should become partly sunny by afternoon (especially inland). Warmer. Highs in the getting well into the 70s, cooler at the coast. Southwest winds at 8-12mph. Mostly cloudy. Lows in the lower to mid 50s, the upper 40s well inland. South to East winds under 5mph. Mostly cloudy. Spotty showers. Highs in the lower to mid 60s. Rain likely during the morning. Remaining mostly cloudy. Highs in the mid 60s. Scattered showers are likely this evening. As the front approaches tonight a period of heavy rain is likely. It’ll be very mild overnight. The front will get hung up just offshore for the weekend. A few morning showers are possible Saturday, but enough dry air should work in from the West to burn off the clouds by afternoon (meaning the sun should shine). Saturday afternoon will be warm. Periods of rain. Chance of a thunderstorm. The rain could be heavy at times. Very mild. Lows in the 50s to lower 60s. South winds at 8-15mph. A few morning showers, otherwise skies should become partly sunny by afternoon. Warmer. Highs in the getting well into the 70s, cooler at the coast. Southwest winds at 8-12mph. Mostly cloudy. Spotty showers. Highs in the lower 60s. Temperatures will be near seasonal averages today as high pressure builds over the Northeast. A mix of sun and clouds is expected. The average high temperature is in the upper 50s. The high will move off the coast on Friday. Clouds will dominate the sky as a front approaches. The day looks to be dry, although areas of fog and spotty drizzle can’t be ruled out in the morning. Showers are likely Friday night. The front will get hung up just offshore for the weekend. A few morning showers are possible Saturday, but enough dry air should work in from the West to burn off the clouds by afternoon (meaning the sun should shine). It’ll be mild. On Sunday a storm will develop over the Southern states and ride up the Appalachians. The day will be mostly cloudy. Showers are likely by afternoon. Sun and clouds. 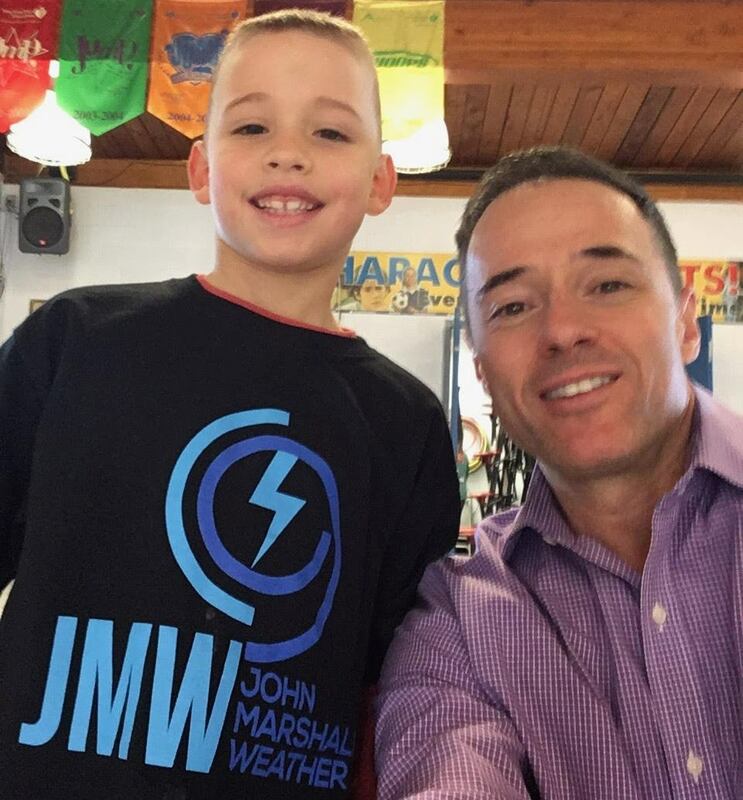 Highs in the mid to 50s. North to Southeast winds at 5-10mph. Mostly cloudy. Lows around 40º-45º. Southeast winds diminishing to 5mph. Mostly cloudy. Areas of morning fog and spotty drizzle. Showers are possible by evening. Highs in the lower 60s. A few morning showers, otherwise skies should become partly sunny by afternoon. Milder. Highs around 70º. Mostly cloudy. Showers are likely by afternoon. Highs in the lower 60s. Temperatures will be at or below seasonal averages through Thursday under mainly sunny skies as high pressure noses in from Southern Canada. The average high temperature is in the upper 50s. High pressure will move off the coast on Friday. Skies will start off sunny but clouds roll in during the afternoon as a front approaches. Showers now look to hold off until evening. Showers are likely Friday night. Mostly sunny. Seasonal. Highs in the upper 50s. Northwest winds at 10-15mph. Mostly clear. Lows around 40º in the City, the 30s inland. Northwest winds at 8-12mph. Partly sunny. Showers are possible by evening. Highs in the lower 60s. A cool front will move through this evening with scattered showers and possibly a thunderstorm. Many areas will remain dry. Skies will become mostly clear overnight. High pressure will move off the coast on Friday. Skies will start off sunny but clouds roll in during the afternoon. Showers now look to hold off until evening. Showers are likely Friday night. The front will get hung up just offshore for the weekend. 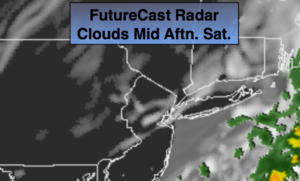 Enough dry air should work in from the West to burn off the clouds on Saturday afternoon (meaning the sun should shine). It’ll be mild. Scattered evening showers and possibly a thunderstorm, otherwise becoming mostly clear. Lows in the 40s throughout. Northwest winds at 8-15mph. Mostly sunny. Cool. Highs in the mid to upper 50s. Northwest winds at 10-15mph. Clouds to sun. Milder. Highs in the mid to around 70º. A warm front will move East of the area this morning. Any early showers will end and skies will become partly sunny today. Temperatures will pop well into the 70s with a Southwest wind. It’ll feel like early June! The wind will back around to the Northeast and East tonight and Tuesday. This will result in cooler temperatures on Tuesday. More clouds than sun is expected. A cool front will approach later in the day with scattered showers. Temperatures will return to more seasonal averages by mid week under mainly sunny skies. The average high temperature is in the upper 50s. Showers are possible later Friday was a front approaches from the West. Any morning showers will end, becoming partly sunny. Warm. Highs in the mid to upper 70s. Southwest winds at 10-15mph. Mostly cloudy. Mild. Lows in the 50s throughout. West to Northeast winds at 5-10mph. Mostly cloudy. Scattered PM showers. Highs in the mid 60s. Mostly sunny. Cooler. Highs in the mid to upper 50s. Partly sunny. Chance of late showers. Highs in the lower 60s. High pressure will move over the area today. It will be another gem. Abundant sunshine and mild readings are expected. Temperatures will be nearly ten degrees above the average of 57º. A warm front will approach tonight with rain developing around midnight. Monday and Tuesday will be changeable days as weak systems rapidly move through the region. Morning showers are expected Monday as the warm front moves through. The clouds will break for some sunshine. It will be warm with highs reaching the 70s. Tuesday will start off with sun but clouds will roll in. A spot shower is possible later in the day. Temperatures will return to more seasonal averages by mid to late week with dry conditions. Mostly sunny. Highs in the mid 60s. Northeast to South winds at 5-10mph. 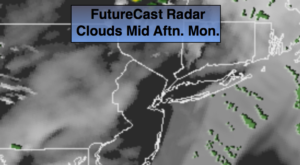 Cloudy with rain developing toward midnight. Mild. Lows in the 50s throughout. South to Southeast wind at 5-10mph. Morning showers, becoming partly sunny. Warm. Highs in the lower 70s. Clouds and sun. Scattered PM shower. Highs in the mid 60s. Mostly sunny. Cooler. Highs in the upper 50s. Today will start off with clouds and patchy drizzle. 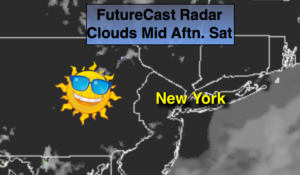 The clouds will break and skies will become mostly sunny. It’ll turn out to be a gorgeous day. Sunday will be another gem. 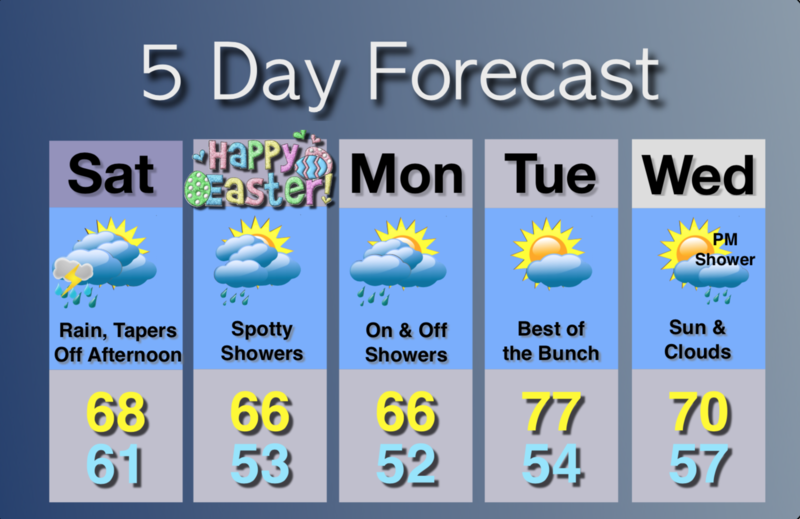 Both days will be mild with readings several degrees above the average of 57º as high pressure moves into the area. Monday and Tuesday will be showery but it won’t be raining all the time. The sun will shine at times. The week ahead looks mild. Clouds and patchy early morning drizzle, otherwise becoming mostly sunny. Mild. Highs in the mid 60s. Northwest winds at 5-10mph. Mostly clear. Lows in the 40s throughout. Northwest to Northeast winds less 5mph. Clouds and rain in the morning, then becoming partly sunny. Warm. Highs near 70º. Clouds and sun. Scattered shower. Highs in the mid 60s. Partly sunny. Cooler. Highs in the upper 50s. High pressure off the New England coast combined with an approaching warm front will result in a dreary, damp and chilly Friday. Spotty showers will develop this morning. Many areas will remain dry. Steadier rain will work in this afternoon. It will be cold enough well North and West for a bit of snow and or sleet, so don’t be surprised. Temperatures will be at least fifteen degrees below the average high of 57º (not feeling like April 5th). Rain will continue tonight. At this time the weekend looks to start off with clouds on Saturday morning with early showers. The clouds should break for some sun on Saturday. Sunday will feature plenty of sun. Both days will be mild with readings several degrees above the average as high pressure moves to the area. Monday will be wet as another system approaches from the West. The week ahead looks mild. Cloudy. Spotty AM showers. Steadier rain developing by afternoon. A bit of snow or sleet may fall well inland. Chilly. Highs in the lower 40s, the 30s inland. East wind at 5-10mph. Rain. Lows in the 30s throughout. East to Northwest winds at 5mph. Early morning showers and clouds will give way to some sun. Mild. Highs in the mid 60s. Rain likely. Highs in the lower 60s. High pressure will take control from the North and West today resulting in a fine day with readings just above the average high of 56º. Gusty winds and very dry air will create conditions that may promote the rapid spread of wildfires. 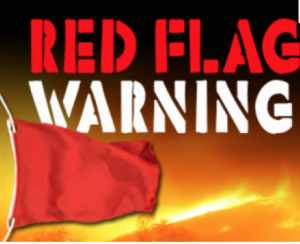 A Red Flag Warning is in effect for this afternoon and early this evening for Northeast NJ, NYC, Southern NY State, Long Island and CT. Please use caution with flammables outdoors. A flow off the ocean and moisture working up from the South will cause showers to develop on Friday. It’ll be much cooler. At this time the weekend looks to start off with clouds on Saturday morning with early showers. The clouds should break for some sun on Saturday. Sunday will feature plenty of sun. Both days will be mild with readings several degrees above the average. Mostly sunny. Highs in the upper 50s. West to Northwest winds at 10-15mph with higher gusts over Eastern sections. Becoming mostly cloudy with a few showers late. Lows in the 30s throughout. Northeast to East winds at 5mph. Cloudy. Rain developing by afternoon. Cooler. Highs in the upper 40s. Early morning showers and clouds will give way to some sun. 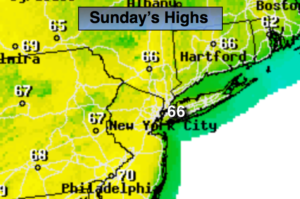 Highs in the lower to mid 60s.